Well, we’ve had on again off again rain. Pop-up showers. Now a cold front is moving through. My garden plan and planting schedule was thrown out of the window weeks ago. We are preparing for market – buying produce bags, business cards, making display cases, calibrating a point-of-sale scale and so on and so forth. What we will market may be a mystery at this point. Naw, that isn’t true, but I am a little on edge. I’ve been scurrying about for advertising, packaging, and harvesting materials. I have been working on our food safety plan (at least in my head and on the ground…I’ve yet to put it to paper). 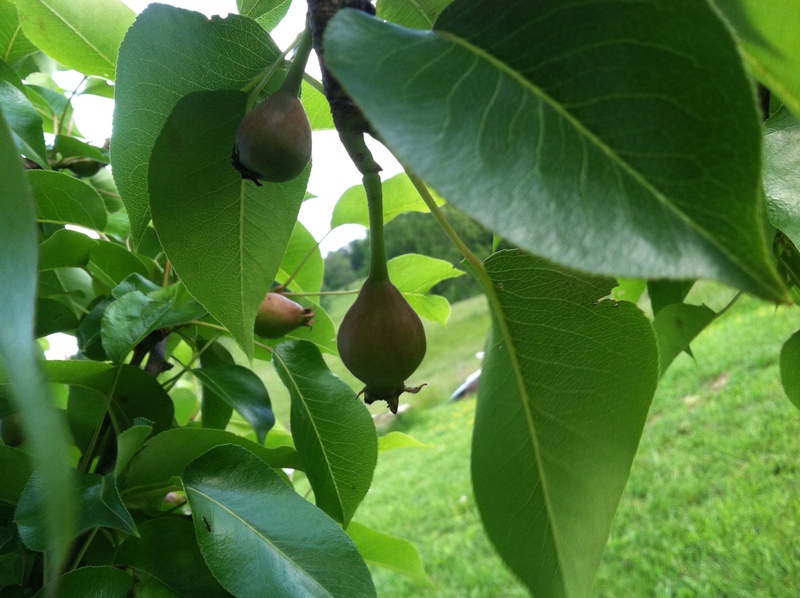 And I know I shouldn’t be discouraged…because every gardener that I know is a bit behind. More corn and beans will be planted this weekend. The beets that were re-seeded are starting to make an appearance. No action on the carrots yet. The onions have doubled in size. The asparagus is starting to go to flower, but there are a few spears that might make their way to my belly. The cabbages, broccolis and Brussels sprouts are doing great beneath the row covers. Speaking of which, I owe all gardeners an apology. All this time I thought sprouts were Brussel sprouts when in point of fact they are really Brussels sprouts. Try saying that phrase – fast with proper annunciation. I am always learning. I threw this photo in because I forgot to take one with the other fruits and because the pears look so pretty. Light green with a rose complexion. Here is how the morning looked out on “the point” as I like to call it. Ominous clouds with sunlight busting through. 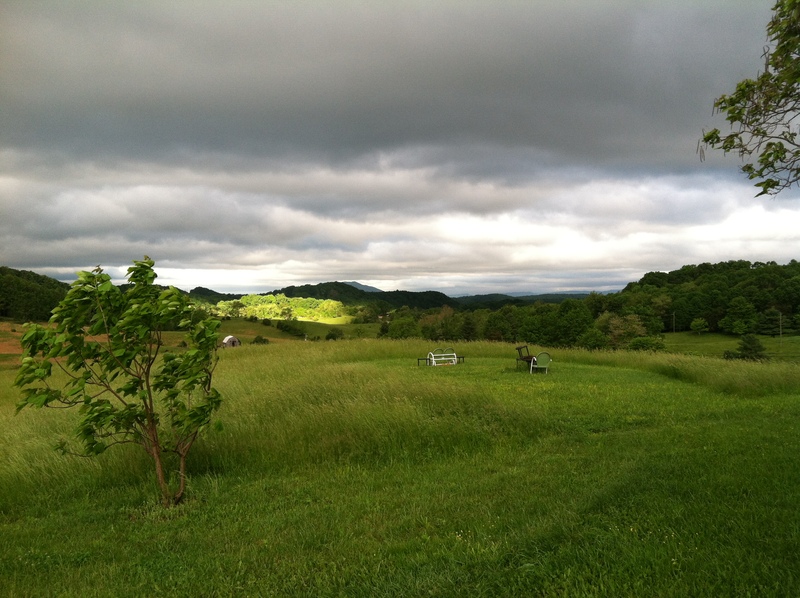 Notice the small catalpa tree – it was dancing wicked in the wind. 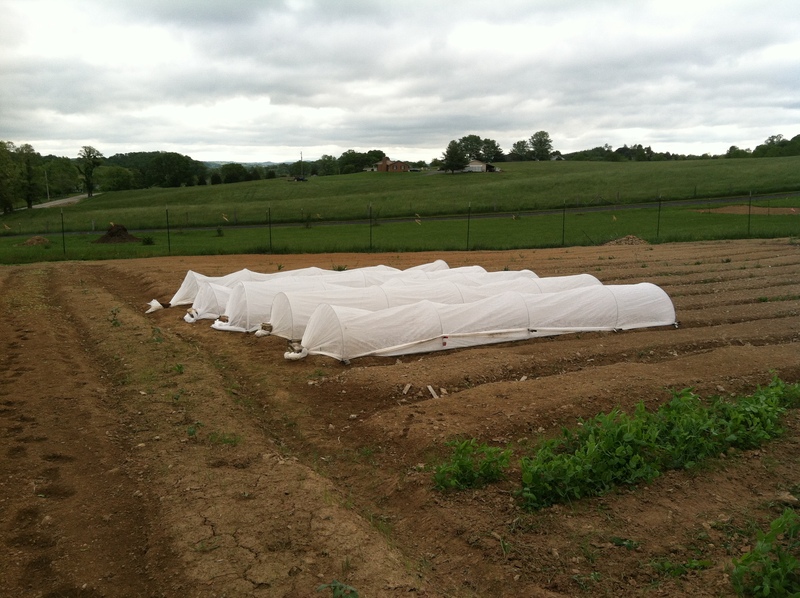 Because of the forecast – lows in the 30s – I scrambled between wind gusts to erect the row covers over all of the beans. Beneath those covers are snuggled up French Velour, Provider, Red Swan, Black Valentine, and Roma snap beans along with Pencil Pod yellow wax beans. The hope is to plant the next round of beans along with some black eyed peas, limas and soybeans. What I didn’t show you is the runner beans. They have started to sprout as well. I have them near the asparagus and herb garden area, specifically along some fencing. 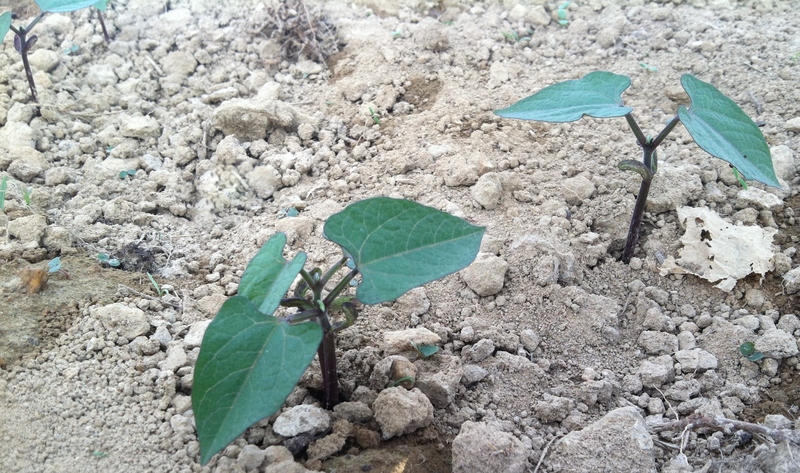 Growing there are Cherokee Trail of Tears and Scarlet Runner beans. Another round of those will be seeded as well as Cranberry runner beans. Also in the works will be the squashes. I will wait until the work week for those, though. Temps are suppose to return to the upper 70s-low 80s. Today, we will be transporting all of the hardened-off tomato transplants from the seed starting area (i.e. town house) out to the farm. They will have to hunker down until this cold front passes through, too. It is looking like next week will be a flurry of activity! As if our weeks are dull and boring anyway. Stay Tuned! ← Rough day at the office?